I AM 100 % COMPOSTABLE. 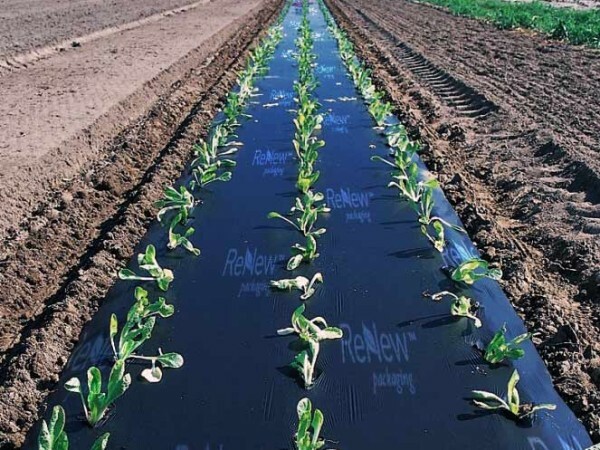 Renew Packaging manufactures compostable film which can be used for several products such as shopping bags, trash liners or agriculture film. 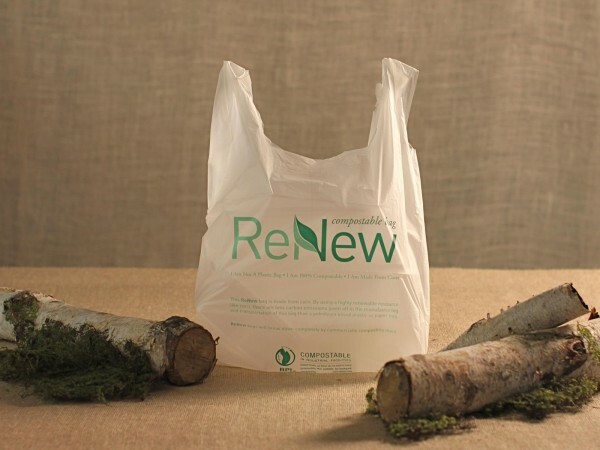 Unlike regular plastic, Renew Bags are 100% compostable bags made with resin derived from vegetable and plant starches and compostable polymers which can be consumed by micro-organisms that live in our soils. 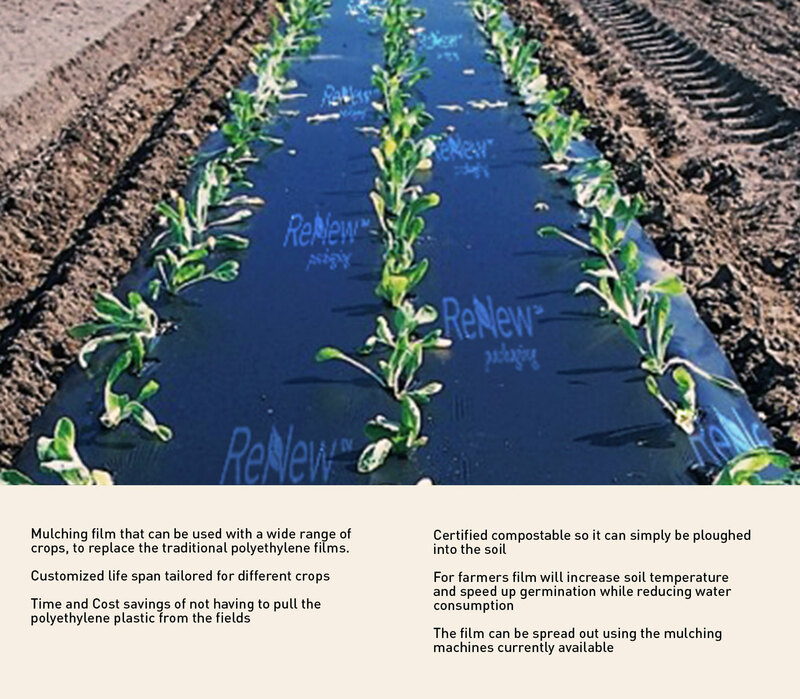 Renew Packaging’s sole purpose is compostable products. 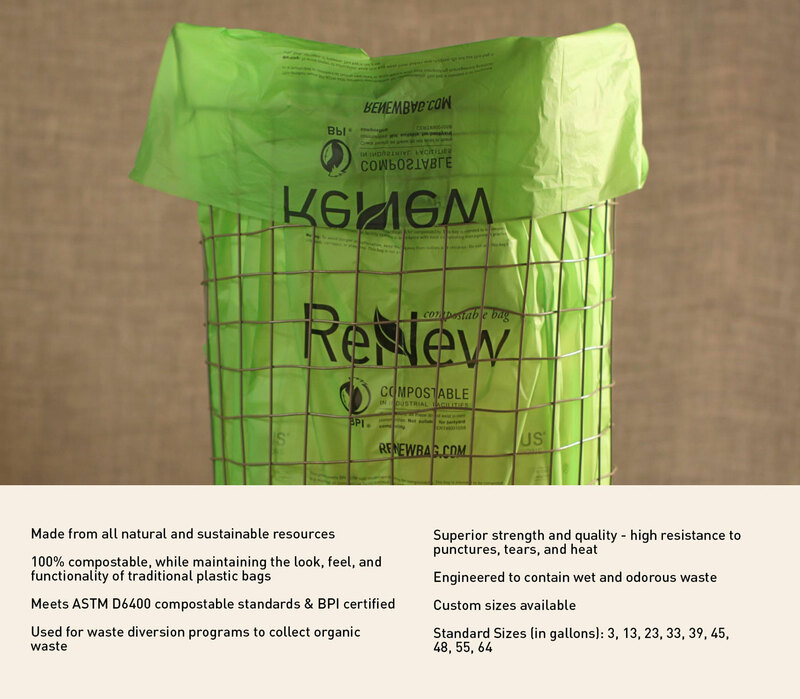 Our team has the experience and expertise to design and recommend the appropriate compostable bag for your business with specific customization available. 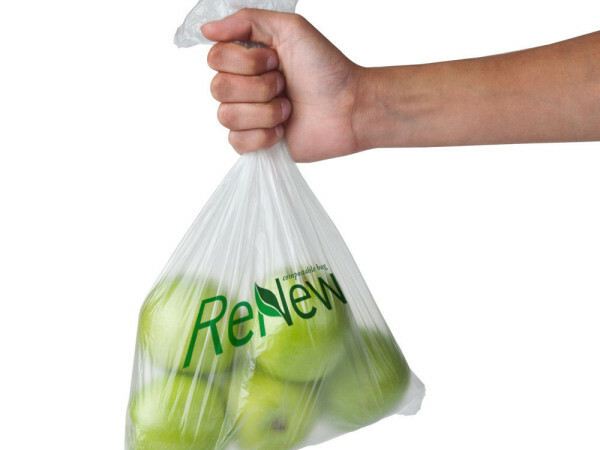 Renew Packaging has grown with several vertical markets including but not limited to grocers, food service, hospitals, retailers and commercial establishments. All of our products have been certified compostable to meet ASTM D6400 composting standards. The Biodegradable Products Institute (BPI) Compostable Logo program is recognized throughout North America (from San Francisco to Prince Edward Island in Canada) as the standard for approved biodegradable products in organics diversion programs. Renew Packaging was awarded a BPI certificate with # 10528508. Scroll through some of our products and click for details. Feel free to contact us for more information about custom products and product variations. Please scroll through to better understand the impact of our products. NON GMO corn. Compared to traditional plastic it can reduce over 40% CO2 emissions. Contain no phthalate, no BPA and are non-toxin and pollution free. performance barrier properties, high heat resistance and excellent odor barrier. Bags can be printed with soy based inks on different color film and a variety of ink colors. 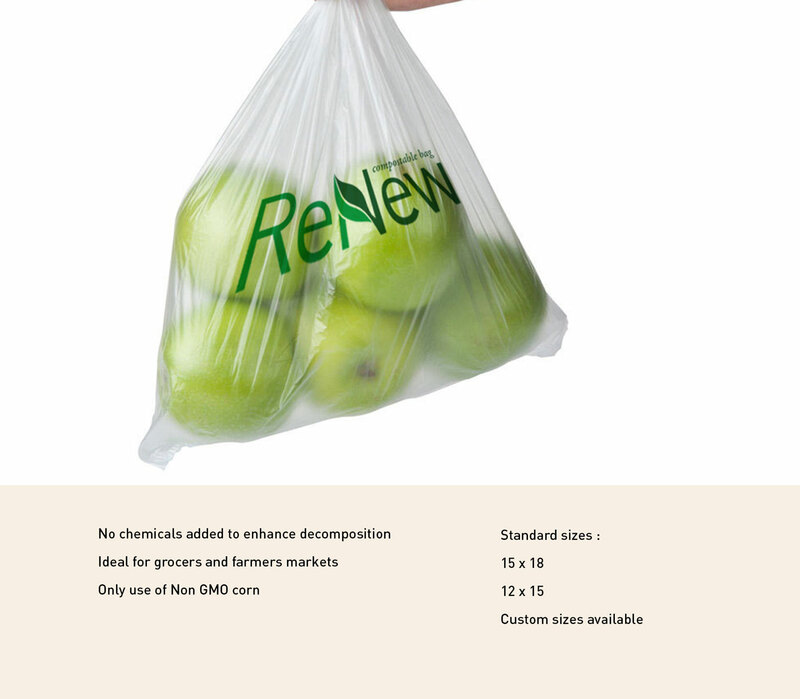 non-compostable plastic (polyethylene) based bags. 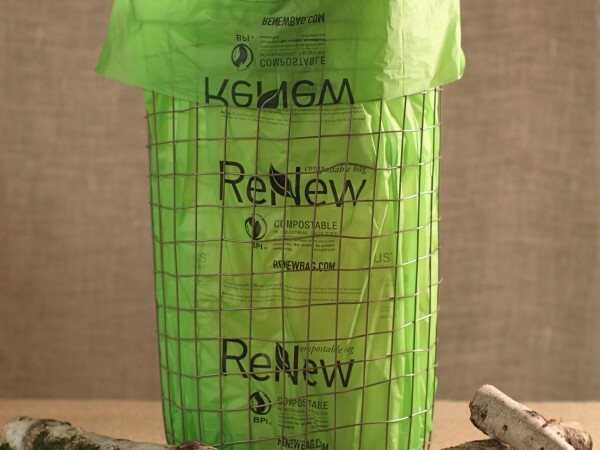 Compostable bags are the single-largest application use for compostable materials. 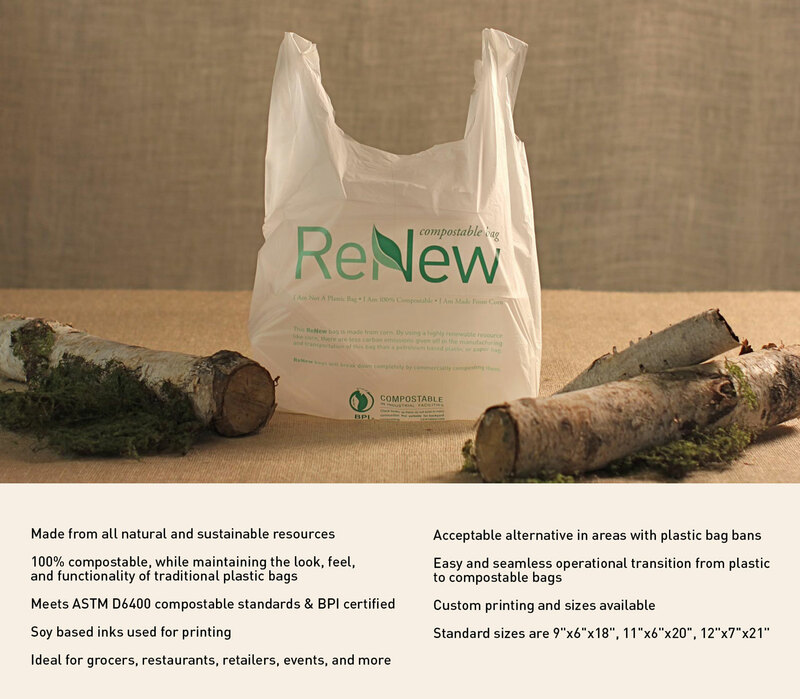 re-use our shopping bags for several applications such as lunch bags, gym bags, etc. a nutrient rich soil amendment. Anything that was once living will decompose. long row to create a controlled biological decomposition. closes the loop on the natural bio-cycle just as Mother Nature intended. We’d love to hear from you, whether it’s regarding a custom compostable product or things we could do better.